Home improvement products of categories like building materials, hardware, gardening, painting, maintenance, storage, flooring, electrical, and many more. Browse Menards Ad and see the latest deals on all these products if there is any. The retailer has 305 stores in Kentucky, Wyoming, Dakota, South Dakota, Nebraska, Iowa, Minnesota, Indiana, Michigan, Ohio, and more states. And the store has been serving since 1959. Other than weekly print ads, you can also occasionally see Tv or Radio ads of Menards. The best way to follow their discounts is to check the ads. The number of deals and the ads can highly increase in Christmas and holiday season. Menards is accepted as the third largest home improvement store in the United States. Menards Weekly Ad has the current deals that are valid for a limited time. Subscribe to the ad to get your ads to your inbox. The 11% rebate will end in 6 days. Menards Ad offers a lot of chances to save more this week. 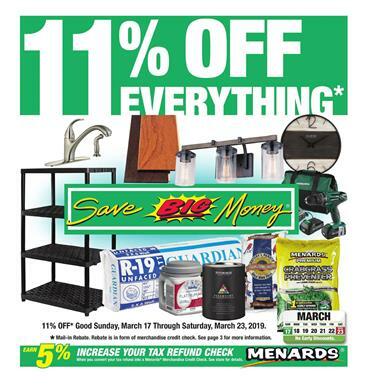 If you want to set up a great garage or a shed in your backyard, this Menards Weekly Ad Sale is a valuable chance for you to save on the shopping for necessary tools. Post frame buildings are also available and you can get estimates in Menards.com/designit page. With the mail-in rebate discount, everything is 11% cheaper this week. For example, the banberry house is normally $140.378 but you will get it for $124,936.42 with the rebate discount. If you have two cars in the family, check out pg 2 for two car garage which will cost $5098.81 with the discount. Everybody loves sheds and storage buildings in their gardens. You can store something, create a workplace for yourself, develop something there. If you have a backyard without nothing, it would be wast of space. Enough space, a good deal at Menards, there is nothing more needed because these are pre-cut construction sheds. You will find 3 digit prices for beautiful products on pg 3. Fences, playsets, storage shed are 11% cheaper on pg 4. Menards has also bench projects, corner decks, and more on the last part of the ad.